You can make an Enduring Power of Guardianship with this downloadable template form for residents of Victoria. An Enduring Power of Guardianship allows you to choose someone to make lifestyle decisions for you if you become unable to do so for yourself. The appointment becomes effective only if and when you become unable to make your own decisions regarding such things as your living accommodations, social life, personal hygiene, etc. You can also give your guardian the power to make decisions about medical treatment, but ONLY if you have not made an Enduring Power of Attorney (Medical Treatment). The package contains instructions on how to complete and execute the form. It also includes a Revocation of Appointment of Enduring Guardian, in case you want to cancel the document at some point. 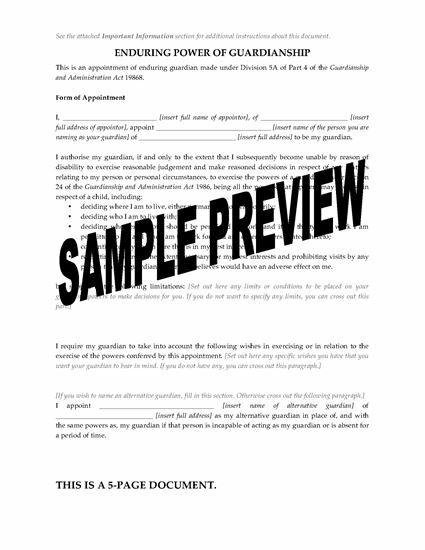 The Victoria Enduring Power of Guardianship and Revocation Form is available as a downloadable and fully editable MS Word document.